“Hyperconnect the world” – per the ICON website, that’s what this South Korean-based blockchain startup is trying to achieve. They have the ambitious aim to link all the world’s blockchain networks and traditional infrastructures, one that has seen ICX, their native token, receive a lot of hype. In less than a year since their initial coin offering, ICX is currently the 34th largest in the market, at a cap of more than US$260 million. As a young cryptocurrency, ICX is still a little bit of an unknown, but also presents significant potential for growth. This guide is going to tell you how to get in on the action and invest in ICON. With a lot of different smart contract platforms coming to prominence, the question of interoperability comes up. How will NEO applications be able to communicate with Ethereum or Cardano apps? This is what ICON is hoping to solve. Their platform will aim to allow different blockchain networks to work with each other, as well as enabling seamless exchanges between different cryptocurrencies. It’s an ambitious project with a significant end use case, but is still in a relatively early stage of development. However, with the launch of their mainnet in 2018, ICON is poised to see significant growth – as of October 2018, the network is already serving around 1000 transactions per day. It’s also partnered with the biggest telecom company in South Korea, SK. It’s very hard to find anywhere to buy ICX with Fiat currencies at this stage. So our guide is going to show you how to trade Bitcoin or Ethereum for ICX on one of the world’s largest exchanges, Binance. If you haven’t already, you will need to register an account on Binance. 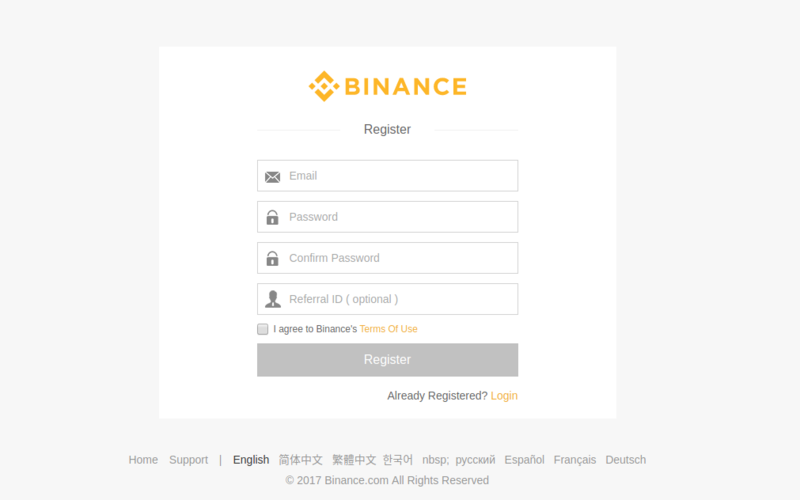 The registration process should be quick, with Binance’s user-friendly interface. Binance requires you to submit a few verification documents before you can start trading. You will also need to set up security measures and 2-Factor Authentication to protect your account. Once your account is approved, you will have to send some Bitcoin or Ethereum to your account on Binance. If you don’t already hold one of these coins, people from most places in the world can purchase with a credit or debit card from sites like Coinmama, Changelly or Coinbase. To do this, go to the top bar and select “Funds”, then “Deposits”. 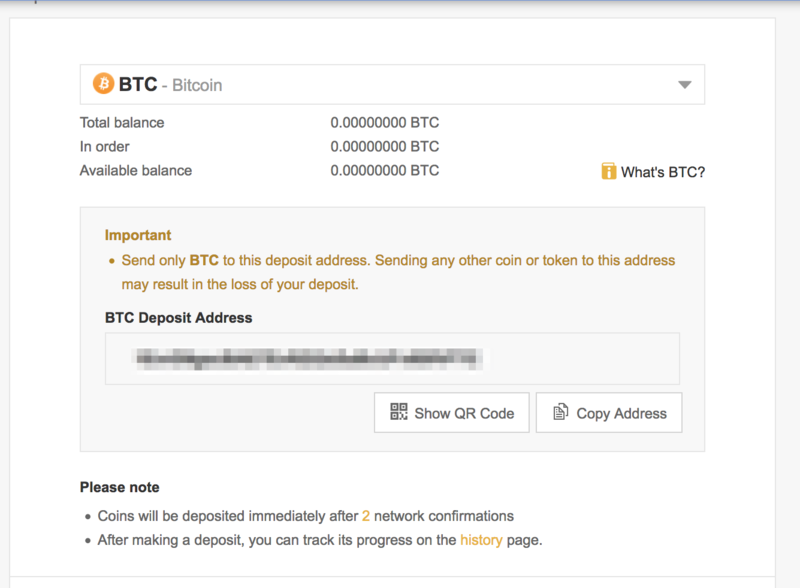 Click on the dropdown menu and choose which coin you wish to send. At the next screen, you will be given a wallet address to send your funds to. Make sure you send only the selected type of coin to this address – ie. only Bitcoin to the Bitcoin address. If you send any other coin to this wallet, your deposit could be lost. You may need to allow some time for the transaction to go through, depending on the level of activity on the network. Be patient and make sure your deposit has gone through before advancing. Now you’ve made a deposit, it’s time to go into the exchange section of Binance. On the top menu, select “Exchange”, then “Basic”. This will bring up the trading screen. On the right-hand side will be a box showing BTC, ETH, BNB, and USDT pairs. Choose the coin you deposited earlier, and search for ICX. Click on the pair (ICX/BTC or ICX/ETH). Even in their Basic exchange, Binance offers a number of ways to help users buy low, and sell high. This includes a comprehensive price and order history for your selected pair, as well as limit orders. Limit orders let you choose a specific price at which you wish to buy or sell. So, when ICX reaches the price you’ve entered, Binance will automatically execute a trade for you. Alternatively, you can elect to buy at the current market price – this should be fine for novice traders. Now select how much you want to buy. You can choose a certain amount of ICX, or to spend 25%, 50%, 75% or 100% of the coins in your BTC/ETH wallet. Click “Buy ICX” to complete your order. After the network confirmation is complete, you’re done! The best practice in cryptocurrency is always to keep your coins in a secure wallet that you control. That means moving your coins off the exchange when you’re finished trading. 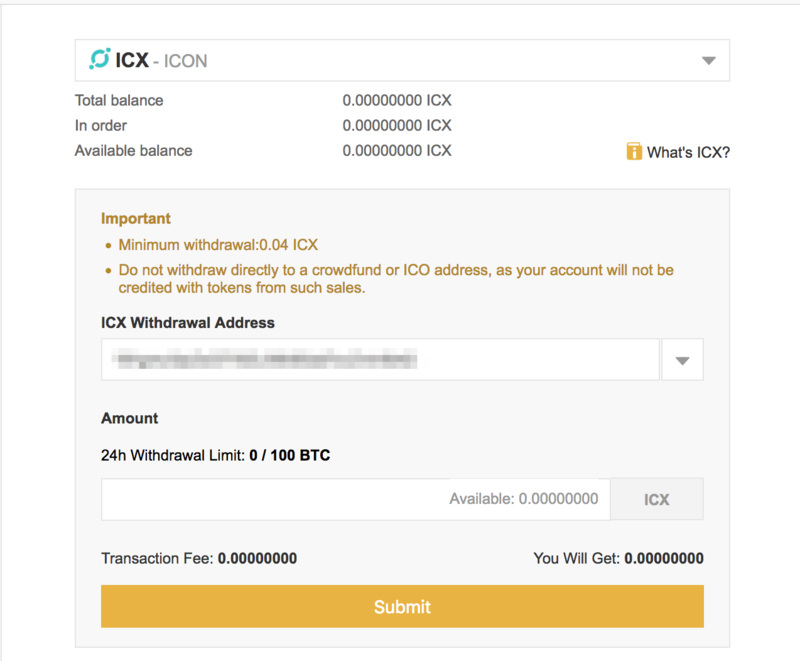 Because it has only recently transferred from an ERC-20 placeholder to a token on the ICON blockchain, there is not yet a wide range of wallets supporting ICX. The most secure option is to use a hardware wallet such as the Ledger Nano S or the Trezor (both of which support ICX). Alternatively, ICONex is a free multi-platform ICX wallet developed by the ICON team themselves. To withdraw your coins from Binance, select “Funds” then “Withdrawals”. Select “ICX” from the dropdown menu. This will prompt you for a wallet address to withdraw your coins to. Add the address from your ICX wallet here, the click “Submit”. Wait a few moments for confirmation from Binance that the withdrawal has been completed. So that’s it! Now you know how to begin investing in ICX, the token behind the hyperconnected decentralized network of the future.